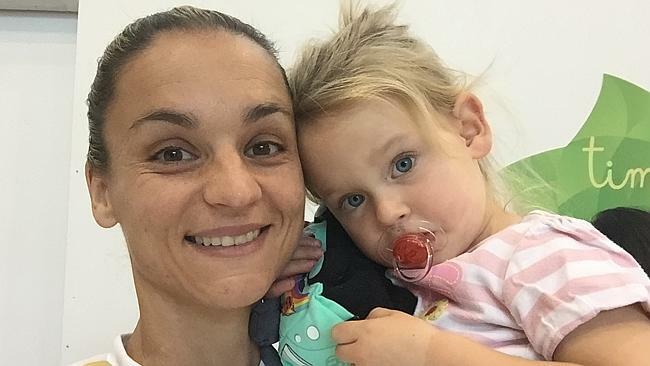 Soccer star Melissa Barbieri, and her husband, Geoff Hudson, welcomed their daughter Holly in 2013 [pictured]. Melissa has been a member of the national women’s squad, the Matildas, since 2002, and was captain when Australia won the Asian Cup in 2010. She currently plays for Adelaide in the W-League, and in her first year with the team, won the W-League goal keeper of the year award. She is in training for the World Cup, which will be her fourth. Basketball coach Sam Woosnam, and her partner Alex Vanrenen, welcomed their daughter Myah on Mother’s Day. A life member of the Women’s National Basketball League, and triple championship player, Sam is currently coach of Kilsyth in the South East Australian Basketball League. Former athlete Amber Halliday, and her partner Mello Bouwmeester, welcomed their son Monty Rex on June 23. Amber is a three-time world champion in lightweight rowing who competed at the 2004 Olympic Games, before swapping to cycling in 2008. She won the Women’s Tour of New Zealand in 2009, but unfortunately her sporting career was ended after a serious racing accident. She is now a rowing coach and public speaker, as well as studying for her PhD in psychology.